The vibe of generosity that pervades the holiday season makes us imagine we’ll be showered with gifts everywhere we go. Yet the frenzy of giving does not extend into nature, any more that it normally does. Rare birds don’t plot to turn up in our backyards just because we’re in the mood for just one more present. Fortunately, nature offers us so much all year long that a little something special under the tree is entirely unnecessary. For that reason, the perfectly prosaic birds I saw this week were splendid anyway, especially in that luminous winter sunlight. Even American Goldfinches at the very nadir of their splendor seemed to transcend their drab plumage. Corey’s Best Bird of the Weekend came very early in the weekend, just after dawn on Friday morning, in fact. 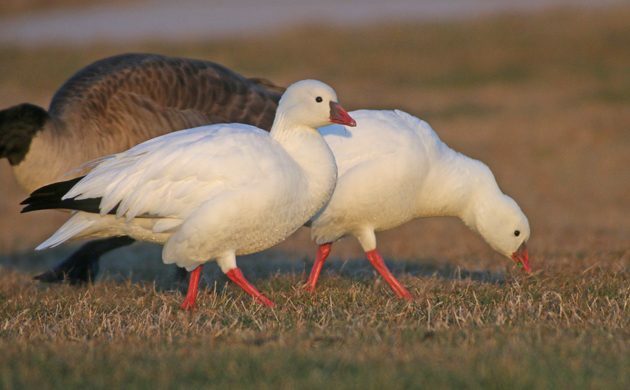 The pair of Ross’s Geese that were found earlier in the week at Robert Moses State Park on Long Island cooperated nicely, placidly feeding in the lawn in the traffic circle while Corey digiscoped them from his car. Not exactly geese-a-laying but close enough for the holiday season! Holiday madness meant no birding this weekend, but while waiting to open the Xmas presents I spotted a lovely Northern Flicker perched on my parents’ roof. It was a nice way to start the holiday! @Corey: Great photo of the geese!